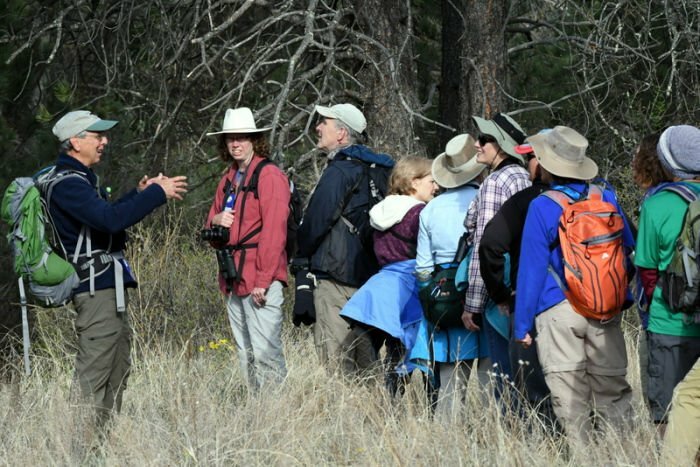 2018 festival participants get out in the field to look for birds. 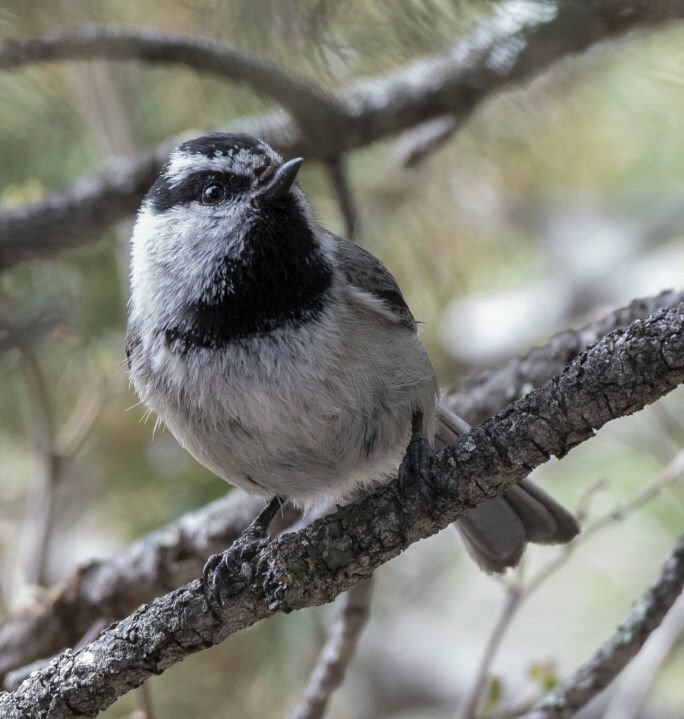 A mountain chickadee was spotted during a 2018 festival field trip. 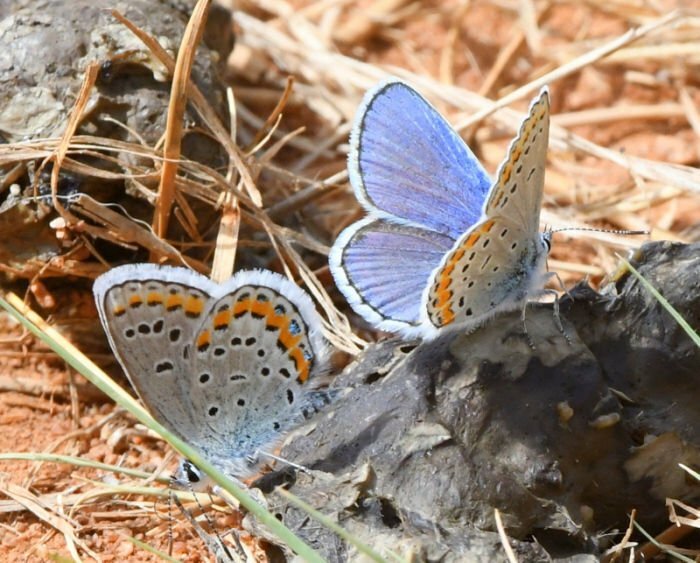 The Mile High Bug Club will lead trips during this year's birding fest to look for insects, like these Blue Melissa butterflies seen on 2018 festival field trips. 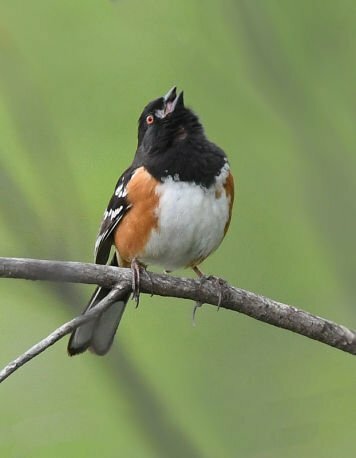 A spotted towhee was sighted during a 2018 festival fieldtrip. A birdwatcher is transfixed on a bird high in the trees during the 2018 festival. 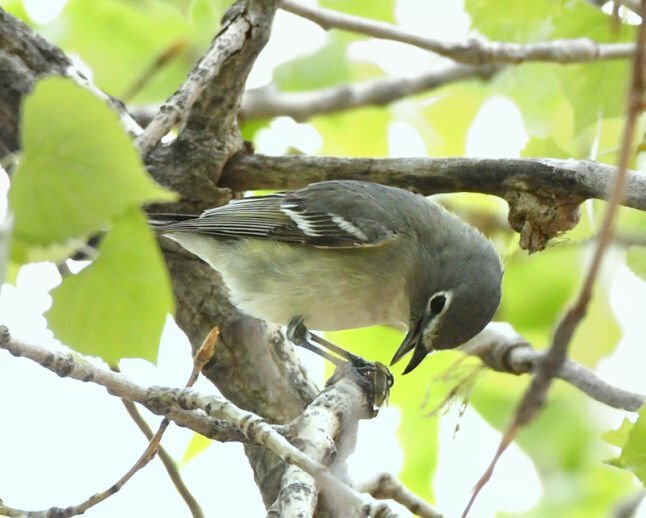 A plumbeous vireo is spotted during a 2018 festival fieldtrip. 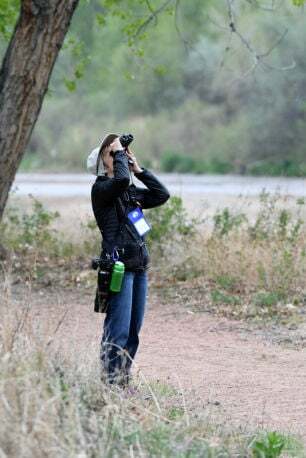 The 5th Annual Pikes Peak Birding and Nature Festival is coming soon, perfectly timed on May 17-19 during the peak of spring bird migration. In addition to resident birds and breeders returning for the summer, flocks of migrants will be winging their way through, resulting in an apex of species diversity and density in the area. Add to that the eruption of birdsong for the breeding season and you have the perfect setting for birdwatching. The event offers a variety of workshops and fieldtrips that promote conservation and education through exploration of natural resources of the Pikes Peak region. The theme festival of “Peaks to Prairie” acknowledges the region offers a special opportunity to explore Colorado’s elevational life zones, from shortgrass plains to alpine, resulting in a plethora of bird species unique to each zone. Attending the event allows participants to meet people with similar interests while learning about local natural areas. Public, private and nonprofit organizations are involved with the event. Birding activities include a workshop on identifying birds by sound with Nathan Pieplow, author of “Peterson Field Guides to Birds Sounds of North America.” Once you have tuned your ear, put your training to the test on a variety of field trips. A highlight of the trip options is a visit to a high-elevation ranch where a local land trust has cooperated with ranchers to preserve the area. Additional outings will extend from the foothills to the summit of Pikes Peak. Riparian areas along the edges of creeks, rivers, lakes and ponds will also be explored. Riparian areas offer everything a bird needs — food, water and shelter — so birds often travel along riparian areas. Fieldtrips will also venture into the rarely accessible Jimmy Camp Creek Park and Coral Bluffs Open Space.The Manitou Experimental Forest north of Woodland Park is a great place to look for the uncommon flammulated owl. Most owls are resident, but “flams” migrate south for the winter. World-renowned flammulated owl researcher Dr. Brian Linkhart will lead trips to look for these tiny raptors that often nest in aspen tree cavities created by woodpeckers. For the artists, wildlife and nature-sketching workshops with a local birder-artist will be available. Birds are connected to the world around us, including one of their favorite food items: insects. The fascinating world of insects can be explored with the Mile High Bug Club. The Club is leading a new excursion to blacklight insects at a private ranch along a lush riparian corridor. Opportunities for rock hounds include a trip to study geology at a restricted-access portion of Paint Mines Interpretive Park, east of Colorado Springs, a prairie location where you might get a glimpse of Colorado’s state bird, the lark bunting. After all of this activity, take some time to unwind Saturday night at a “Birds and Brews” event featuring appetizers and drinks. Relax with a background of live music while enjoying photos from the field trips and studying compilations of bird sightings. You can also visit with live creatures on display and enter an auction for birding gear and supplies. The festival has grown every year with most attendees from El Paso and Teller counties, but more are signing up from other regions, and even other states. Todd Marts with El Paso County Parks has been closely involved with the festival for many years. He attributed the success of the festival to the elevational diversity of the area and the reputable leaders of the field trips and programs. “Basically we have found that people really want to get outside on the field trips,” Marts said. Early bird registrations is $30 adult, $25 military, and $15 for 12 and under. After April 28, rates increase by $5. For more details and to register, go to pikespeakbirdingandnaturefestival.org.